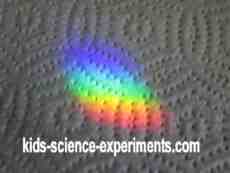 Crystal Prism Rainbow - Demonstrating the effects of passing light using a prism. Do you have a crystal prisms hanging in a window in your home? If not this would make a magical and amazing gift for any mom to enjoy. I like the round ball shaped prisms best. 1. If your prism does not have nylon string or thread attached to it, add some so that you can hang it from a window pane. 2. 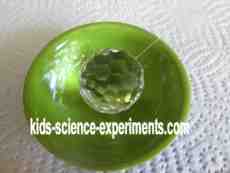 Place the crystal prisms in a window so that it dangles and can receive the sunlight coming in through the glass window. 3. 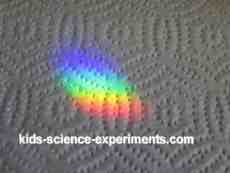 When the sunlight hits the prism at the right angle you will see a rainbow appear around the room you are standing in. 4. When the rainbows appear, spin the crystal prism and watch in amazement at the beautiful colored rainbows appearing throughout your room. The rainbows you see do depend on the shape and pattern of your prism. White light is a mixture of colors (spectrum) . Red, Orange, Yellow, Green, Blue, Indigo and Violet are the colors contained in the spectrum. Light changes speed as it moves from the air to the prism. 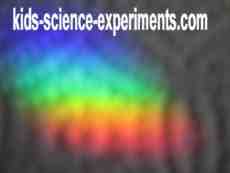 The speed change causes the light to be refracted and to enter the prism at a different angle. After a rain shower you can usually see a rainbow in the sky if the sun is shining. A rainbow is formed by the refraction of the sunlight in the droplets of water that are suspended in the air from the rain shower. Think of the rain drops as prisms. 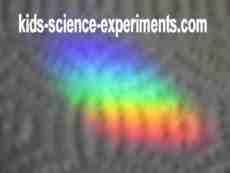 Dispersion by a prism shows that white light is a mixture of all the colors (spectrum). Dispersion –As white light passes from the air into a block (prism) of a transparent material like glass the different colors of the white light are refracted by different amounts. This makes white light split up into the colors of the spectrum. This process is called dispersion. Refraction – the white light is separated and bent according to its colour then refracted again and continues to leave the prism at different angles which creates an effect similar to a rainbow... Each colour has a certain wavelength and its own unique refraction angle.